This post will be the first in a series of 2014 recap posts, reviewing accomplishments and events of the past year for Tiffin and Seneca County in the areas of downtown, economic, and community development. 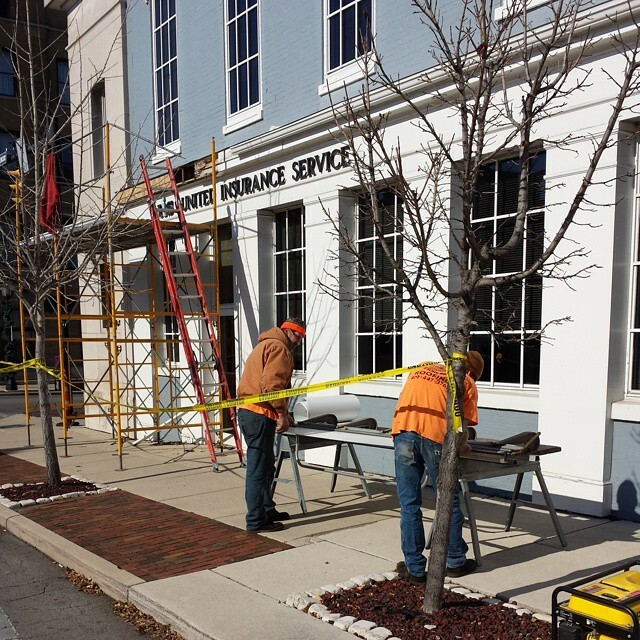 One major new program (and accomplishment) for last year was the City of Tiffin’s new $50,000 Facade Enhancement Program, a grant program for building exteriors in historic downtown. The program paid fifty percent reimbursement for any eligible exterior improvements, up to $10,000 covering tuck pointing of brick, doors, windows, awnings, painting, roofing and fire escapes. The Architectural Board of Review approved 11 façade improvement projects on ten different buildings. The total reinvestment spurred by this grant was $150,416.86, and this occurred in approximately three months time. Earlier this year, we did a post on the Clover Club’s improvements. We hope to provide some insight into these projects in future posts as well. Sharon Gosche with the Clover Club Tavern and Eatery located at 266 S. Washington Street. She was approved for tuck pointing, balcony restoration, painting per the historic color palate, awnings, roof repairs and door repairs. RS Financial with the building at 49 S. Washington Street. They were approved to rebuild the second floor balcony and add the original railing found in the attic. Carol Yeager’s building at 205-207 S. Washington Street. She was approved to add awnings, repair doors and paint per the historic color palate. She was later approved for roof repairs and tuck pointing discovered during the initial work. S & E Rentals located at 136 S. Washington Street. They were approved to repair the roof and replace the front windows. WFR Real estate at 144 S. Washington Street. They were approved to replace the six front windows to match the existing and paint the cornice and sills per the historic color palate. Vicek Orthodontics with their property at 10 Riverside Drive. They were approved to repair damaged EIFS and paint to match exiting. They were also approved to replace an existing door. JVC Properties building at 65-71 East Market Street. They were approved to replace the second and third floor windows. WC Felton Agency at 51 S. Washington Street. They were approved for replacing damaged fascia boards, and gutters along with two exterior lights. The Laird Arcade at 70 East Market Street was approved for exterior painting per the historic color palate. The final approval was the Knights of Columbus building at 49 East Perry Street. They are approved to add storm windows and replace the main entry doors. As of mid-December, the RS Financial, S&E Rentals and WC Felton projects have been completed and have received their reimbursement funds. Seeing the success of this year, Mayor Montz and Tiffin City Council renewed this grant program and will be funding it with $100,000 in an effort to continue the revitalization efforts already in motion. The City of Tiffin is looking to include single and double family residential units in the program following approval at the January 5th City Council Meeting. This is good for the economic development of the downtown, will assist owners with the preservation of these historic homes, improve the district, improve property values, will help to keep the tradition of downtown alive, will assist with safety with code improvements and at some point, they could become possible retail. With this change, the program will now cover all buildings in Tiffin’s historic downtown. The 2015 applications will be reviewed on a first come first serve basis beginning on January 5th. Applications for the Façade Enhancement Program along with the Architectural Board of Review Approval forms, which are required to receive grant approval, are available at in an earlier post. All forms and any questions are to be directed to Amy Reinhart, the Downtown Development Coordinator with SIEDC.